Romney also brought his campaigning to a halt at the beginning of the week, using a campaign bus to deliver hurricane supplies in Virginia and collecting goods at campaign offices in states that were expected to be impacted by the storm. With the hurricane approaching, some of Romney’s comments about FEMA were brought into the spotlight. When asked about natural disasters and FEMA at a Republican debate last year, Romney seemed to suggest that disaster relief should be in the hands of the states or private companies, rather than the federal government. This week, Romney changed his tune, saying that “FEMA plays a key role in working with states and localities,â€ and that he would continue to fund the agency. Mia Love, the Saratoga Springs, Utah mayor who gained national attention after her speech at the RNC, is on track to become the first black female Republican in the House of Representatives. The GOP favorite has received support from Romney and House Speaker John Boehner, and a recent poll shows she is now leading the Democratic incumbent, Rep. Jim Matheson, by double digits. 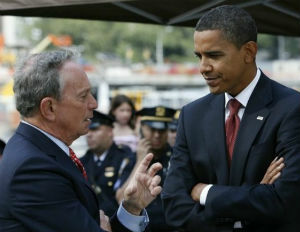 In what was considered a surprise announcement, New York City mayor Michael Bloomberg endorsed Obama for president. Bloomberg, who is an Independent, wrote in an editorial that the devastation of Hurricane Sandy “brought the stakes of Tuesday’s presidential election into sharp relief.â€ Bloomberg feels that President Obama has a better approach to climate change, as well as issues such as women’s reproductive rights and marriage equality.